Sam Houston State University contracts and projects valued at almost $2 million were approved Friday by the university's regents, which also honored three employees for their distinguished service. The regents held their regular quarterly meeting on the SHSU campus, during which they swore in new regent James L. Sweatt III of Dallas, helped dedicate the Blackwood Law Enforcement Management Institute of Texas building on campus, and conducted business for nine board institutions. The Texas State University System includes in addition to Sam Houston State, Angelo State University, Lamar University, Lamar Institute of Technology, Lamar State College (Orange), Lamar State College (Port Arthur), Southwest Texas State University, Sul Ross State University, and Sul Ross State University Rio Grande College (Laredo). 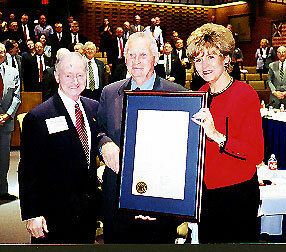 Resolutions were adopted naming Ross W. Lovell professor emeritus of management; naming Hugh E. Hall, Jr., left, professor emeritus of physics; and honoring Charles W. Tackett, right, for 50 years of service to law enforcement in Texas. The resolutions were presented by Bobby K. Marks, SHSU president, and Nancy Neal, regents chair. Lovell was unable to attend the presentation. 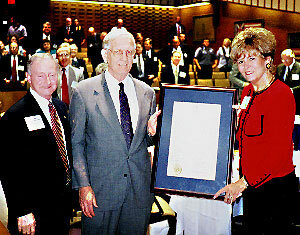 "Throughout his many years of continuous service with Sam Houston State University," Lovell's resolution stated, "as a man of integrity, warmth, and good humor, he has proven himself to be a superb mentor to students, faculty, staff, alumni and friends of the university and thereby has demonstrated himself to be a professional, an educator, a courteous statesman, and a compassionate human being." Lovell joined the faculty in 1972. Hall, who joined the faculty in 1967 after working for Texaco and teaching at the University of Houston, was praised for his "creative ability in research and independent work," his "sensitivity to the needs of his students and ability to establish rapport with them," and for his "lasting and significant contributions through his teaching in the field of physics, to research through his seminars and numerous publications, and to the university, the state, and the nation." Tackett, who began his law enforcement service with the Corpus Christi Police Department in November, 1950, earned his bachelor's degree from Sam Houston State in 1972 and was named the university's director of campus security in 1973. "His dauntless pursuit of service to mankind is demonstrated through his lifetime involvement in law enforcement and as mentor to thousands of students as well as university faculty and staff as well as members of the community," Tackett's resolution stated. It called his 50 years in law enforcement "a remarkable milestone of service to humankind," praised his "single-minded sense of responsibility and commitment," and called his 50 years of service "unequaled by any commissioned officer in Texas." In SHSU business, the board awarded a contract for the construction of a metal building for industrial technology, at a cost of $716,152; authorized issuance of purchase orders for $600,000 in improvements to King Hall; approved modifications to the building housing the music department at a cost of $346,000; and authorized issuance of contracts for roof repairs to the Newton Gresham Library, and new roofs for the Dan Rather Communication Building and Farrington Science Building.